Trending at AU $81.39eBay determines this price through a machine-learned model of the product's sale prices within the last 90 days. Jabra Elite Sport Wireless Bluetooth Earbuds. Advanced personalised fitness (integrated Jabra Sport LifeTM app). 3-year Limited Manufacturers Warranty against defects from the effects of perspiration. Jabra Stealth materials Polycarbonate (PC), Polycarbonate acryl butadien styren (PC ABS), Silicon Rubber. What’s in the box?. Supported Bluetooth profiles A2DP (v1.2), AVRCP ABS Only. Hands free profile (v1.6), Headset profile (v1.2), phone book access profile (v1.0). Trending at AU $95.40eBay determines this price through a machine-learned model of the product's sale prices within the last 90 days. Jabra's lightest ever headset. With a sleek elegant design and a sound so real it’s like you were there yourself, you’ll never have to miss a conversation again. There is nothing in the rules that says you can’t live for success and be stylish while doing so. What’s in the box?. Headset and charging case mate- rials: Polycarbonate/Acryl Butadien Styren (PC/ABS), Polycarbonate (PC), Silicon Rubber. Supported Bluetooth profiles Headset profile (v1.2), hands free profile (v1.6), A2DP (v1.3), phone book access profile (v1.0). Jabra Storm materials Polycarbonate (PC), polycarbonate acryl butadien styren (PC ABS), silicon rubber. What’s in the box?. 1 Jabra Storm headset, 1 USB charging cable, 1 extra eargel, 1 wind sock, 1 quick start guide. Say hello to the next generation Jabra Stealth takes Bluetooth headsets to the next level by being the first. Uncompromised sound and comfort Remote access to siri and google now, With Jabra Stealth you can just leave. Trending at AU $91.88eBay determines this price through a machine-learned model of the product's sale prices within the last 90 days. Give up the wires without giving up great sound. Unleash your music with rich, full-spectrum Dolby sound, built with solid steel and a secure fit, Jabra Rox Wireless is for music gurus who are ready for action. This item is band new, never opened. Jabra Stealth Wireless Headset Black. Jabra Stealth materials: Polycarbonate (PC), Polycarbonate acryl butadien styren (PC ABS), Silicon Rubber. Advanced Noise Blackout™ technology ensures clear, noise-free calls. The Halo Smart’s most distinguishing design element is its contoured neckband with wires sticking out on either end for the earbuds. Removable stickers on the band note where magnets are located for attaching the backs of the earbuds, which are also magnetized so they can be snapped to each other. A fairly large battery is crammed inside the band to give the Halo Smart extended operation of up to 15 hours for music and 17 hours of call time, based on Jabra’s estimates. 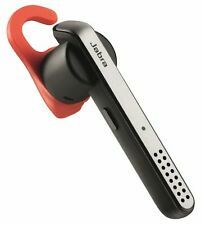 Brand Jabra Model Halo Smart Wireless Bluetooth Headset Wireless Technology Bluetooth, Applicable Connector(s) USB, Micro USB Earpiece Double Earpiece Design Earbud (In Ear) Fit Design In-Ear only, Neckband Feature Waterproof Colour Red UPC 615822007795 MPN Jabr. • Superior sound with unique 4-microphone technology • Personalize your music with a customizable equalizer • Up to 5 hours battery, 15 hours with charging case • True wireless connection stability to reduce call and music dropouts • IP55 rated, with 2-year warranty against water and dust* • One-touch access to Amazon Alexa**, Siri®, and Google Now™. Jabra Classic Bluetooth Headset: Let this headset announce the name connected to your incoming call so you can ignore or reject it with the easy-to-reach answer/end button. You'll also be able to stream audio from your phone, tablet or mp3 player while you're on the go. 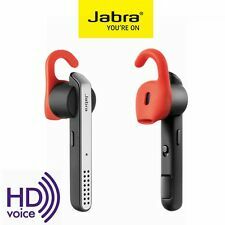 Brand Jabra Model Classic Bluetooth Headset Wireless Technology Bluetooth, Applicable Connector(s) USB, Micro USB Earpiece Single Earpiece Design Earbud (In Ear) Fit Design Ear-Hook, In-Ear only Feature HD Voice Colour White UPC 6013904696938 MPN JabraClassicBluetooth MPN JabraClassicBluetooth Package includes1 x Jabra Classic Bluetooth Headset White Headset (Original Box) . Catch every call while you're exercising with these waterproof Jabra Elite Sport earbuds. These Jabra Elite Sport earbuds have an in-ear heart rate monitor and an integrated app for fitness analysis and coaching. Jabra Sport Coach Wireless materials Silicone, PC/ABS, PC, PP, PET, TPE. What’s in the box?. Warranty Limited 3 year warranty against failure from sweat. Headset type Bluetooth in-ear stereo headphones. Jabra Stealth Bluetooth Headset. 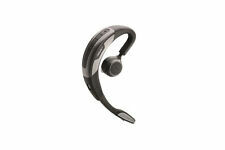 Jabra part number:Stealth backed byJabra 1 Year Warranty. With a UC compatible dongle, you can transfer calls from your softphone to your smartphone using the Jabra Stealth UC. The setup guidance gives you step-by-step instructions on the pairing process and how to get the most out of your device. Jabra Assist. With multiple Eargels supplied, you can find the fit that is most secure for you. Product Type: Earset. Jabra Talk 2. Talk 2 OTE15 Earset. HD Voice for clearer conversation. Microphone Design: Cheek. Compatible with Apple iOS and Android smartphones. Wireless Technology: Bluetooth. The Find my Jabra/Car function is able to locate recent known locations of the headset so that you never lose it in your car, and you can make the headset emit a sound so that it's easier to find. Free Jabra Assist App. Bring your device to life with the exclusive Jabra Sound app. A music player that gives you the full Dolby experience tailored to your Jabra headphones and more. Travels well Rox Wireless is protected against dust and water with solid steel that takes the rap when you're at your most active. 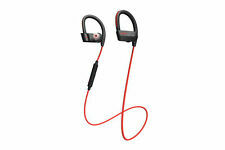 JABRA SPORT ROX WIRELESS. Jabra Sport Rox Wireless. Sport Rox Wireless earbuds are built to last with solid steel. They're sweat- and stormproof and built to US Military rain, shock, sand, and dust standards - so there's no excuse for missing a workout. What’s in the box?. 1 Jabra Rox Wireless earbuds, 4 sets of ColorCore EarGels™, 3 sets of Jabra EarWings™, 1 Fitclip, 1 USB cable, 1 protective bag, 1 quick start guide. Jabra Rox Wireless materials Stainless Steel, Silicon, PC/ABS, PC, PP, PET, TPE. 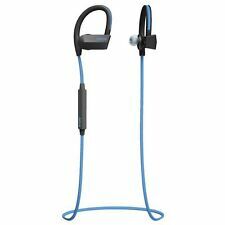 Genuine Jabra Halo Smart In-Ear Wireless Bluetooth Neckband Headphones BLACK. 1 x Jabra Halo Smart. Item is USED and in great condition. May have minimal scratches, images are for illustration purposes only. 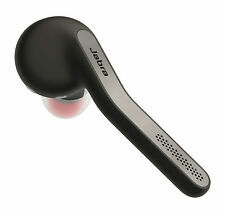 Jabra Sport Pulse Wireless materials Silicone, PC/ABS, PC, PP, PET, TPE. What’s in the box?. Warranty Limited 3 year warranty against failure from sweat. Headset type Bluetooth in-ear stereo headphones. JABRA SPORT ROX WIRELESS. Sport Rox Wireless earbuds are built to last with solid steel. They're sweat- and stormproof and built to US Military rain, shock, sand, and dust standards - so there's no excuse for missing a workout. Jabra Rox Bluetooth Wireless Stereo Headset. Jabra part number:Rox backed byJabra 1 Year Warranty. When you need to pause, Jabra Rox does too. Once you’re done using the earbuds, simply snap them together around your neck using exclusive power-saving magnets. Jabra Sport Pulse Bluetooth Stereo Headset. 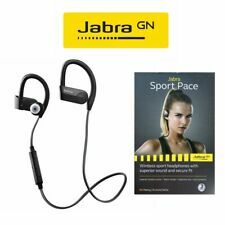 Jabra part number:Sport Pulse HR backed byJabra 1 Year Warranty. Understanding your heart rate is now as simple as putting on your headphones. Sport Pulse ensures you always train at the right intensity level to improve your performance. JABRA SPORT ROX WHITE Bluetooth. JABRA SPORT ROX WIRELESS. Do you have an NFC-enabled phone?. Just tap Jabra Sport Rox Wireless and the phone together to pair them quickly and effortlessly. Jabra Sport Rox Wireless.